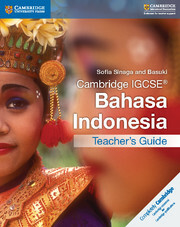 This first edition has been written by experienced teachers to meet the requirements for the latest Cambridge IGCSE® Bahasa Indonesia syllabus (0538). With comprehensive coverage of the Cambridge IGCSE® Bahasa Indonesia syllabus, this Coursebook contains a wealth of highly engaging authentic texts to motivate and engage students in their studies and help them prepare for their assessment. The modular approach allows the content to be taught in a way that suits every classroom environment, and also supports independent learning. The topic-based structure allows acquisition of skills to be woven into a deeper understanding of the language and its literature. Fully covers the three main skills areas of the syllabus: reading; writing; speaking and responding. Includes a rich variety of activities supported by practice exercises to help prepare students for their assessment. Provides wide range of text sources that will develop student handling of real-world materials. The topic-based structure allows acquisition of skills to be woven into a deeper understanding of the language and its literature. Fully aligned to the curriculum and matches the specification, with five topics forming the basis of the chapters, and three themes in each topic. Relevant, real-world content engages students and enables them to understand the relevance of their learning. Contains exam style questions with help to prepare for the assessment.